Diffusion is the process of dispersing essential oils so that their aroma fills a room or an area with the natural fragrance. From the simple to the elaborate, many different methods exist for diffusing essential oils into a room. Three easy methods exist which can be done with things you probably already have in your household. 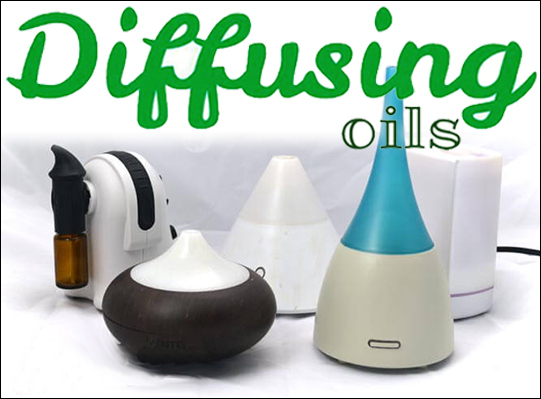 In addition, there are numerous diffusers and diffusing devices available for purchase. This article will detail the different types of devices and methods that may be used. Heat: These are not recommended as heat will damage the constituents of the oil. Person (like clay): Essential oil is applied directly to a surface like clay, quickly absorbed and the scent is dispersed within a small distance. The smell is strong at first, but fades. Great for personal mood support but not deep therapeutic use. Evaporative – fan: This type of diffuser uses a fan to push air through a pad that contains essential oils. The oil is not damaged. This is is an economical choice but because of the size of the molecules, therapeutic value is limited. Nebulizer: This type of diffuser diffuses oils,without water, as a fine mist. The Nebulizer technology breaks down the particles in the essential oil so that they are easily absorbed deep into the body. Its recommended to run a Nebulizer-style diffuser only 15 min. per hour. Our preference is 5 minutes on, 20 minutes off. The smaller the particle the deeper into the body and lungs it will travel. This is why doctors have patients use nebulizers to administer medicines for breathing and coughing issues. Particles between 5 and 20 microns will only reach the upper airway: nose, larynx, trachea. Particles between 2 and 5 microns will reach the lower airways. If you can't afford a diffuser yet, you can just put a drop into a tissue or into your hands and breathe the oil in for the aromatic benefits, or breathe directly from the bottle! Effort always pays off and I do believe you’re writing is a great example. Since my ideas have already been cveroed by others (vanilla and flowers), I started thinking outside the box (as they say).The least silly is putting a container of something nice smelling on a heat source like an old style TV or on top of the fridge. If it was warm enough it would activate the smells.Something a little sillier is to start baking ! There is nothing so yummy as the smell of freshly baked cinnamon rolls or an apple pie.What if you could invent something that would smell pretty when wet, but in a natural, healthy way. Like if you take a shower, when the humidity hit the paint on the walls they gave off a nice gentle smell.Or when the furnace (or air conditioner) kicks in the filter is embedded with a light lemony smell.For really silliness, if they could create a breed of dog or cat that would give off a nice smell when petted But on a more serious note, some people are highly allergic (myself included) to potpourri so I would be careful not to overdo it as it could trigger problems over time, or for visitors. You can continue to use them, but the oils can cause the parts to erode. Check if your diffuser is made with a rigid HDPE plastic (High-density polyethylene). HDPE plastic and plastics with the number 1 (PETE) and 2 are generally safe with citrus oils. Whether your problem is mosquitoes, house flies, fruit flies or moths, you can use essential oils in your diffuser to deter these critters from entering your home.